NEW YORK CITY (WABC) -- Ceremonies around the tri-state area commemorated the 75th anniversary of the attack on Pearl Harbor. The attack in the early morning hours of December 7, 1941 plunged the United States into World War II and left more than 2,300 service people dead. In New York City, Intrepid Sea, Air & Space Museum marked the attack aboard the historic aircraft carrier Intrepid. 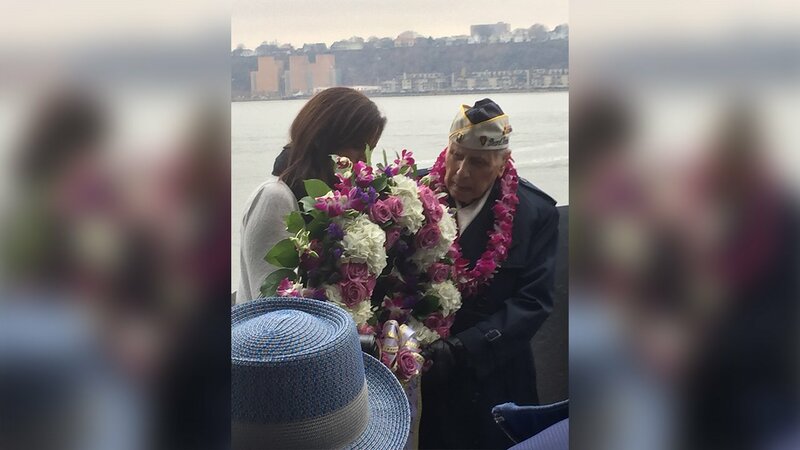 Two Pearl Harbor survivors from the New York metropolitan area and former USS Intrepid crew members attended a wreath-laying ceremony on the ship's fantail. The Intrepid was commissioned after the attack and launched on April 26, 1943 in Virginia. The ship arrived in Pearl Harbor in January 1944 to participate in the invasion of Marshall Islands. In Upstate New York, Franklin D. Roosevelt's first draft of his "Day of Infamy" speech is on display at his former estate-turned-museum. "Day of Infamy: 24 Hours that Changed History" at the Franklin D. Roosevelt Presidential Library and Museum in Hyde Park will be open to the public through Dec. 31. The exhibit includes a rare public display of Roosevelt's first draft of the speech he dictated to his secretary in the hours after the attack. The first draft is rarely displayed in order to protect its condition. It's also available to view online. Officials also gathered on the battleship New Jersey in Camden to remember the anniversary and to commemorate the ship's launch one year after the attack. A memorial wreath was cast from the floating museum into the Delaware River.